I am grateful you’re here to explore my transformational invitation. You’re a woman who is ready to begin bringing your needs to the front of the line. You want to create more joy, peace and grace in your life, and you know it. You are not afraid to do the work that needs to be done to heal yourself. You want to say “YES!” to your deepest desires, and you know that NOW is the time. You know that every experience you have had up to this point has prepared you to step forward as a woman ready to give herself the personal attention she desires and deserves—ready to create for herself a peaceful, joyful, and sacred oasis. It is with boundless joy and blissful energy that I receive your intention to reshape your sense of self and wipe the mirror clean. I’ve prayed, meditated, and journaled about this process, and I know that this is what I’m here on Earth to facilitate. I want to generously support you as a woman, teacher, mentor, life coach, yoga instructor, author, artist, photographer, wife, mother, daughter, and transformation enthusiast. You work hard. You run a household. You care for your friends and family. You wrestle with self-care, putting everyone and everything else before your own needs. You play more roles in life than humanly possible and your well is dry. This is your invitation for a rich and full guided feminine awakening. The Transformation Goddess experience is a combination of custom private retreat coaching and mentoring. Offering a bubbling well of support, and straightforward actionable steps to help you move gracefully through your current situation. Saying YES to The Transformation Goddess Experience Invitation is saying YES to your Divine Feminine Power. There will be a lot of accountability—so if you don’t have the time or burning desire right now, it might not be the best fit. Allow for some quiet contemplation before you make your decision, because this is the kind of offering that deserves your full attention and commitment. You are not willing to invest the time and energy right now. You are not game for disciplined excavation. You must be willing to dig deep, play and participate. And move forward while being fully supported for 3 full months as you gracefully transform yourself into the woman you are meant to be. Shann Vander Leek: Successful television advertising executive turned Transformation Goddess, Yogini, best selling author, and founder of True Balance International. She is the co-founder of Anxiety Slayer, author of Life on Your Terms, and creator of the Sacred Heart Teachings and Goddess Talk Sessions. Shann coaches powerful women facing life-altering change who are ready to reclaim their feminine sovereignty and transform their precious lives. She is a mama, author, entrepreneur, artist, and mentor to the women who are attracted to her transformational work. Shann’s courageous journey of self-discovery includes yoga teacher training, silent retreat, deep shadow work, Artist’s Way facilitation, Grandmother’s teachings, Changing Woman initiation and healing sweat lodge ceremonies. As a bonus for applying, you will receive my Transformation Goddess Experience Album guaranteed to transport you to a divine feminine oasis. Plus, when you say yes to this experience, you will receive an exquisite gift, fit for a Transformation Goddess. Applications are reviewed on a first-come, first-served basis. Please be transparent and authentic with your answers. I promise that your personal sharing is 100% private and confidential. Your answers will inform our time together during your complimentary interview. The Transformation Goddess Experience is an investment – a valuable jewel that requires a commitment of time, energy, and money. As a Transformation Goddess, I have invested thousands of dollars in my spiritual, emotional, and physical education. I’ve partnered with incredible teachers and coaches to fully develop, enhance, and appreciate the secret sweetness of my goddess life. I’m prepared to hold space for you. 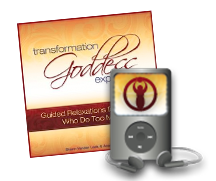 The Transformation Goddess Experience investment is $1197.00. By submitting your application, you agree that you are willing and able to invest in this experience. Monthly payment plans are available for a slightly higher price. Still not sure? This is your invitation to submit your application anyway. We can talk about all of your options during your complimentary – no strings attached interview. Please note that no money changes hands until after our conversation.